The reason you need both is that the monolingual dictionary by itself is too difficult for an intermediate student to use, but the bilingual dictionary is limited in size and won't have the most difficult words in it. Over time, you'll move to using the monolingual dictionary more and more--especially if the device lets you use the bilingual to look up unknown words that appear in the monolingual's definitions. When you don't need the bilingual anymore, you won't be an intermediate anymore either. At this point, I know of only four devices that are able to support multiple dictionaries in this way. I'll discuss their pros and cons and then mention some other devices that are known not to work. I have already written at length about how to read a foreign novel on a Kindle e-reader. All three of the current models seem to be running the exact same software as far as foreign-language support is concerned. Whenever you download a foreign-language book, Amazon automatically downloads the appropriate monolingual dictionary for free. This is the cheapest Kindle that will do the job. It doesn't have the built-in light the other Kindles have, it's heavier than the Voyage, and it has lower screen resolution, but it's half the price of a Paperwhite and only a third the price of a Voyage. Otherwise, they all have about the same features. If price matters, this is the Kindle to get. Caveat: this is a model I haven't ever used personally. I see that Amazon is offering Kindles on sale for National Reading Month. I don't get a kickback, but I know that many people have wanted to try reading a foreign novel with a Kindle but been unable to do so. At $59 ($20 off the regular price), this is probably the cheapest anyone can get into the game. If $200 doesn't seem like a lot, and you want the best, this is the one to get. I was pleased with the weight reduction when I switched from a Paperwhite, and I appreciated the resolution improvement too--especially for reading the accent marks on French letters. Even the little page-turn strips on the side are nice, once you get used to them. 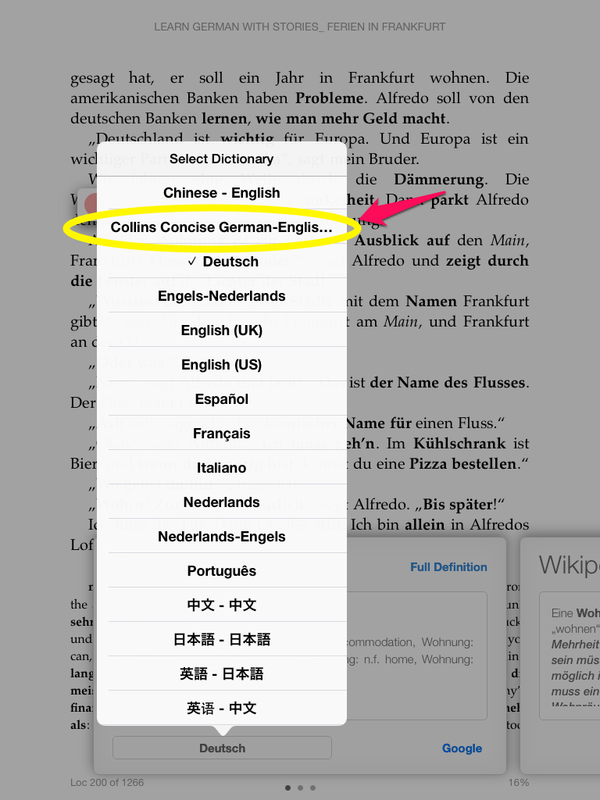 Apple's iPad and iPhone host a Kindle app that appears to have all of the foreign-dictionary support that the Amazon e-readers have. If you already have an iPhone or iPad, that would obviously be the cheapest alternative--hands down. The screen shot from André Klein's web site clearly shows that you can press on a word, read the definition, decide that you want to see that in a different dictionary, and select one without closing the dialog. The Paperwhite I and the Kindle Touch also support multiple dictionaries, although not as conveniently. My original post on how to read a foreign novel on a Kindle describes the extra hoops you had to jump through to make those work. 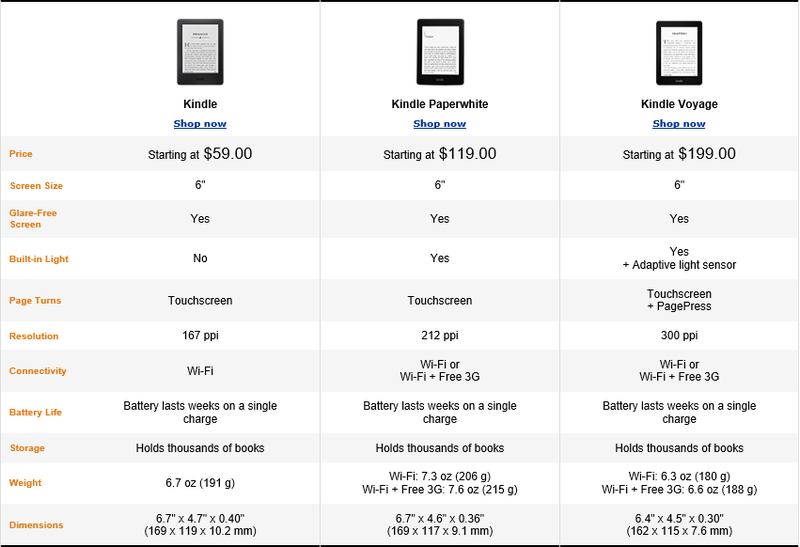 Prior to the Kindle Touch, Amazon's devices didn't have touch-sensitive screens. However, a determined reader could move the cursor next to a target word and get a definition anyway. Readers have told me that the same instructions for installing a bilingual dictionary which worked for the Touch will also work for the older Kindles. At present, I know of no other devices that have multidictionary support. I would be very happy to get information from more people who use a variety of devices. In particular, I can't figure out whether it does or does not work on a Kobo e-reader. The documentation suggests that you can install and remove dictionaries, but it doesn't say how you change the default dictionary for a given book. Here are a few that are known to not work. It doesn't let you change the dictionary at all. If you open a Spanish book it still tries to use an English dictionary. One wonders why it isn't easier for Amazon to just have a single code base for all their apps and devices. You can't change the dictionary on a Nook without rooting the device, which I don't recommend. If you want to read Spanish books, you'd have to buy a Spanish Nook. Supposedly the Nook apps all work the same way. If you want to read a novel in a foreign language, you either need to run the Kindle app on an iPad/iPhone or else buy one of the three Kindle e-readers. If anyone can send me screen shots showing that some other device or app also works, I'll be very happy to include that info. "(I wonder how they ever managed with paper books.)" I haven't used the current base-model Kindle, but I own an older light-less Nook. Even in very good light the contrast was so low that I found it deeply unpleasant to read for extended periods of time. In low light it was totally useless, and a clip-on book light caused bad glare on a large portion of the screen. Useful feedback nevertheless. I'll probably update this article in September or October around the time new devices come out for Christmas. Still, it really does look like Kindle is the only game in town for dedicated e-readers. That's a pity because I think Amazon would benefit from some competition. Thanks for the useful info. One correction: my Nook 4.1 (on a Samsung Tab4) allows you to select the monolingual dictionary of your choice, under 'settings'. However, I don't yet know if you can use a bilingual dictionary, and it seems there is no way to quickly choose between 2 dictionaries. To follow up on my previous comment: On the Nook you can select the built-in monolingual dictionary for English, French, Spanish, German, Italian, or Dutch. You are limited to the built-in dictionaries and cannot download or use other dictionaries. As a data point, I can say that using the Kindle app on my Android device gives no dictionary support at all. I'll have to try reading with a Kindle one of these days. I'm not sure I would like having a dictionary so handy. It seems a bit too quick for actual learning. In general, I seem to have good results in just reading without looking up every word. I'm not sure if that's a skill or perhaps a state of mind that let's me live in uncertainty for a while. Often by the end of the paragraph, or a few paragraphs, I will have figured it out, just as one does in a conversation. To be honest, this approach goes against a lot that I was taught in the university as well as in my professional life, but it seems to work for me and I find it quite freeing. Perhaps I'm only pretending to understand and enjoy what I read. :-) When I was getting started with Italian, I used to say "Faccio finta di parlare italiano e gli italiani fingono di capire." So long as we're all happy!